Taylor's Sweet Little Art and Nerd Site: Sketch Card of the Day- Stonedar! 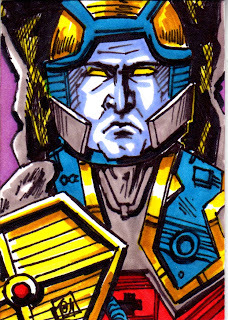 Sketch Card of the Day- Stonedar! Today's deviation is Stonedar! Stondar is the second of the two Rock People in the Masters of the Universe franchise. He is the older, wiser, level headed leader of the two. He's like a father figure with a tough exterior. And by tough, I mean rock. I did get a vintage Stondar toy recently, and I'm torn about which rock person I like more. I am leaning towards Stonedar a bit more. I think it's his color scheme. He just reminds me of a cosmonaut. And for this character, it makes sense due to the fact that his rocking surface is cratered and asteroid like. As we get more and more MOTU Classics toys made and revealed every month, I keep looking forward to the reveal of the Rock People. I think the one thing I look forward to most is their modernized bio. It does make one wonder... What did the rock people's creators have in mind when they designed these characters? What could their rocky pasts be? And where do the new creators want to take them? You can also see this sketch card here. Give us a like, if you want! And, if you like what we have, be sure to tell your friends! We need your word of mouth to help us keep making shows! Sketch Card of the Day- Snout Spout! Sketch Card of the Day -Bow! Sketch Card of the Day- She-Ra! Sketch Card of the Day- Snake Face! Sketch Card of the Day- Sssqueeze! Sketch Card of the Day- Flogg! Sketch Card of Day- The Mighty Spector! Sketch Card of the Day- Rio Blast! Sketch Card of the day- Whiplash! Sketch Card of the day- The Faceless One!